This started out as a long response in the comments section of this recent post, but it immediately became worthy of its own post. I read a great article on Finnegans Wake a while back (same article discussed here and here) in which a whole class that was studying the book found the Wakean replication---or dream distortion---for each of their own names. It's a weird and interesting characteristic about the book that you can find something that at least sounds like or in some way resembles your name somewhere in there. My favorite instance of this is Marshall McLuhan mentioned as "Meereschal MacMuhun" on pg 254. Within was my guide and I raised a dome on the wherewithouts - corresponds to my being self-compelled by the guide within to emigrate from New York a few years back, and throughout the roam thus far I've established myself, set up shop, or "raised a dome" in a few different locations amid the wherewithouts. 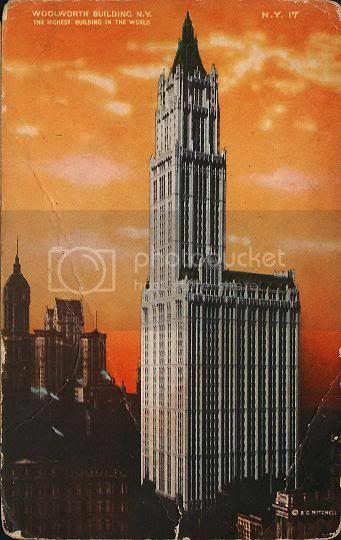 my wellworth building sprang sky spearing spires - refers to the Woolworth Building in downtown Manhattan, the same majestic old building under which I stood daily during four years of college, awaiting the express bus to bring me home to Staten Island. Also, the awful tors or "awful tours" are the often rough, stressful patches in my travels thus far. 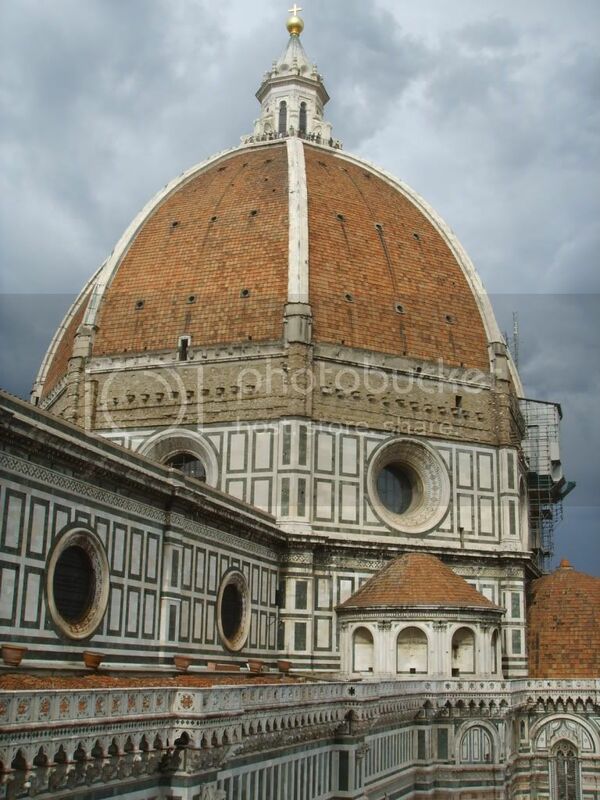 cloud cupoled campaniles - a cupola is a dome on a building and campanile is Italian for "bell-tower" (The Leaning Tower of Pisa is a campanile), confirming for us that the whole sentence is about buildings, architecture and growth. Nice post. It's funny that in thinking about a review I'm planning to write on Alan Glynn's Dark Fields, I've been thinking a lot about buildings and even building roams. I will say 'tor' leads me to think of mountain tors, which would fit in with the sky spearing spires as well. I haven't found my own dream distorted name in the book yet, though of course, Shaun the Postman is close enough for now. Just realized "awful tors" is also Eiffel Towers. Good find! And I just realized I left a very cryptic 'fascinationg' at the end of my last comment. That's what comes of not previewing your own comment adequately. @PQ: I will not think that it’s also Eiffel Towers if you didn’t mention it. The tower is mesmerizing because of the orange background color. My idea of a pretty suave adult lifestyle is living on a high rise building like this at the heart of the city. You can easily access any form of recreation.